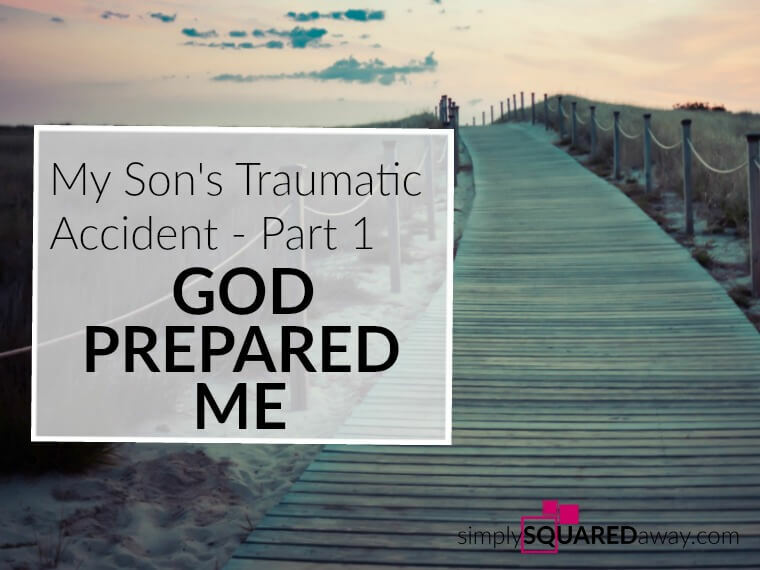 Read My Son’s Traumatic Accident – Part 1: God Prepared Me. I was in the stands as my oldest son’s basketball team played their rivals. It was intense and the stands were packed. The student sections were going wild cheering back and forth. I couldn’t even tell you who won that game. I just remember that last memory of my second son standing in the student section with his friends. Less than 30 seconds later my phone rang. I grabbed the keys and we left immediately to go to him at the scene of the accident. Pulling up to the scene sent my heartbeat racing. This looked more serious than I had imagined. 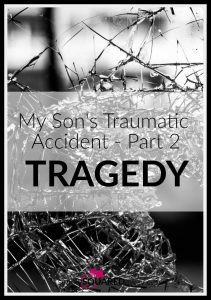 There were police, firetrucks, cars on the side of the road and lights swirling all around. We parked and ran over to where the commotion was to find Cayden was still in the car. They were getting the jaws of life to cut him out of the back seat. We stood watching, unable to go any closer, praying that he was okay. Finally, they had him on a stretcher and were carrying him toward the ambulance. We ran up to him and hugged him and kissed him. A neck brace intact, strapped down, and crying, he told my husband he just didn’t want to be paralyzed. In the movies, the family member gets in the back and holds the injured person’s hand, don’t they? I had to sit in the front seat. All I could do was turn to look back and watch the medics work on him. I watched as they cut off all his clothes (brand new Christmas gifts) and constantly asked him if he could feel when they touched him here or there. It hit me. Emotion gripped me as I imagined the worst. But, I found peace in the fact that he was coherent and could answer their questions. He was alive. My husband took the car back to the house to get our other children and meet us at the hospital. I got my cell phone out to call the house. My phone was dead! It’s like that commercial when the lady can’t take a video during her daughter’s dance solo because her storage is full. The ambulance driver had to lend me his phone and we charged mine during the 20 minute drive to the hospital. I told the kids to get ready, dad was on his way, and pray because Cayden has been hurt and it could be serious. We arrived at the hospital to an entire team of people. I remember this picture in my head perfectly. 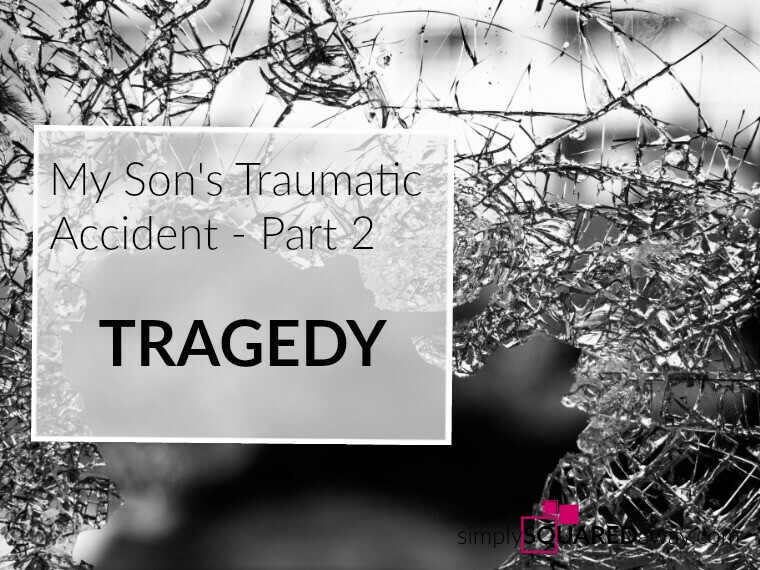 There were at least 20 doctors, nurses, a chaplain, a patient liaison, and more all standing there in their robes and gloves and masks, staring as he was rolled in, ready to tend to Cayden. Over the next few hours we waited. We prayed. We cried. When we could go in the room we held Cayden and thanked God he was still alive. He could barely move any part of his body. He had crusted blood on his nose and a few scratches on his hands. They wouldn’t let him move until after they had a CT scan and then an MRI. The MRI took a long time as they had to scan the entire length of his spine. He laid flat on his back, unable to move, for hours. My very good friend and her husband came to the hospital immediately. Tears roll down my face thinking about it. Would I have went immediately to the hospital? They sat with us, prayed, and eventually took our other kids to get some essentials and to sleep at their house. Another very good friend and her husband came a little later and sat with us until 2:00 in the morning during the MRI. She “threw together” a bag of goodies for us – a journal, pen, snack bars, mints, gum, Kleenex, drinks, etc. I used that journal until it fell apart. And those Kleenex until the box was empty. Having my closest friends there gave me more comfort than I would have expected. Although, if more people came it would’ve been too much. The good in people is amazing. Seeing how beautiful people are has been the biggest blessing in this whole thing. People are kind and caring and generous and genuine. They’ve prayed and sent cards and called and brought meals. They gave money and bought t-shirts and organized and served. 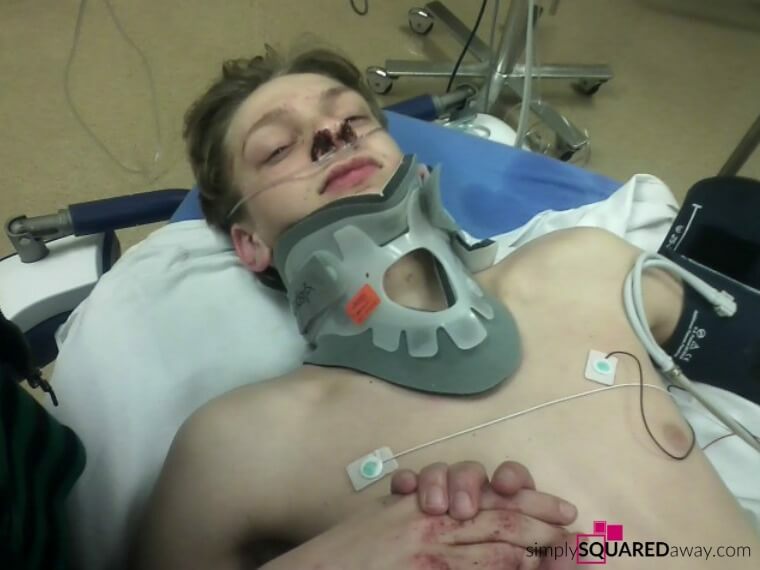 The MRI showed several fractures in the C5 and C6 vertebrae and a badly bruised spinal cord at that location. Because his vertebrae were not broken apart and everything was still in place, they made the decision not to do surgery/spinal fusion at that time. They were going to try and allow the bones to heal on their own. They would X-ray often to be sure the spine was not moving out of place. We learned a lot about spinal cords. I don’t know that I ever thought about the spinal cord before this. Except I do remember seeing Christopher Reeve on television sitting in a wheelchair with a ventilator and unable to move. Aside from the ventilator, would that be Cayden’s future? The spine has three sections: the cervical (C – neck area), thoracic (T – shoulder to mid back) and lumbar (L – mid back to lower back). Here is a great picture. There are two types of nerves in your spinal cord. Sensory nerves transmit sensations such as touch, pressure, pain and temperature back to your brain from the surface of your skin. Motor nerves send messages from your brain to your muscles. Each motor nerve in the spinal cord delivers a message from the brain to specific parts of your body. It leaves the spinal cord (with the message from your brain) at different points. For example, the message telling your diaphragm to breath leaves the spine at C3 and C4. To move your fingers the message is carried from the brain and leaves the spinal cord at C8 and T1. These messages from your brain can’t get through when there is a damaged spinal cord, thus causing paralysis. Cayden’s cord was damaged in the cervical spine so the messages couldn’t get to any part of his body except his shoulders and head and upper chest. He couldn’t move anything except his head, a little of his wrists, and his shoulders. Thankfully, he could breath. Here is a great picture and description of the nerves at each point in the spinal cord and what they control. We were moved to ICU and the days that followed were hard. Because it was a teaching hospital there were teams of people (neurology team, spine team, ICU team, general team, psychology, blood draw team, rehab team, etc). Each team came at least once a day (I think twice). Every time each team came they would ask Cayden if he could feel this or if he could move that. They had him try to move it again…even if he couldn’t the hour before. “Try as hard as you can,” they would say to him. The protocol is to immediately raise his blood pressure in order to flush the spinal cord for optimal healing. This caused his stomach to feel sick and he’d throw up. That is SCARY when you can’t move! The vomit had to be suctioned out of his mouth or he’d choke on it. They stuck an NG tube up his nose to his stomach. He had IV’s in his arms and finally a pic line in his foot. He was uncomfortable and it was painful. Nerve pain in his hands hurt the most. Not having worked in the medical field, I never realized how important bowel, bladder and the skin is. Vitally important. Your body has to poop and pee or you die. To protect your skin from developing sores you must rotate the body every two hours and support it with pads and gel pillows. Special boots/slippers must be worn to protect where your feet rest on the bed. You have to put wraps around your calves to promote blood circulation and prevent clotting. We continue to learn about skin, bowel, bladder, blood pressure, life with quadriplegia (also called tetraplegia), and more. 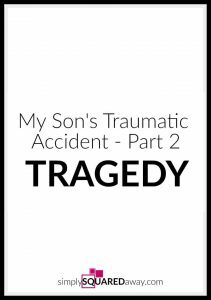 My son is a C5/C6 quadriplegic (also called tetraplegic) which means partial or full paralysis in all four limbs. Months. What does that even mean? What happens next? How much will he recover? Or, will he recover at all? Will he just lay there for the rest of his life? We don’t know was the answer for everything. Everything. Later we learned that it’s true. No spinal cord patient heals the same. Nobody knows what will heal or if and how it will recover. For example, one person with the same level of injury has hands that do not close (she calls them pancake hands) where Cayden’s hands do not open. The physical and occupational therapists came in on day three. I remember standing, watching, holding my breath, waiting to see what they would say. What were they going to do? I have a vivid memory of them moving and stretching Cayden’s legs and arms, evaluating him. They smiled so excitedly and said something like, “Oh, you have your wrist flexors!” Like, duh, if your wrists can flex upward you can do anything! Afterward their evaluation, the PT and OT told us he would be able to do lots of things and live a full life. That meant the world to me and still brings tears remembering their faces filled with confidence and hope. He couldn’t even move but he was going to be able to live a full life. Slowly, that first week, the things attached to Cayden’s body decreased. The blood pressure medicine was finished. The NG tube was taken out. His IVs were removed. 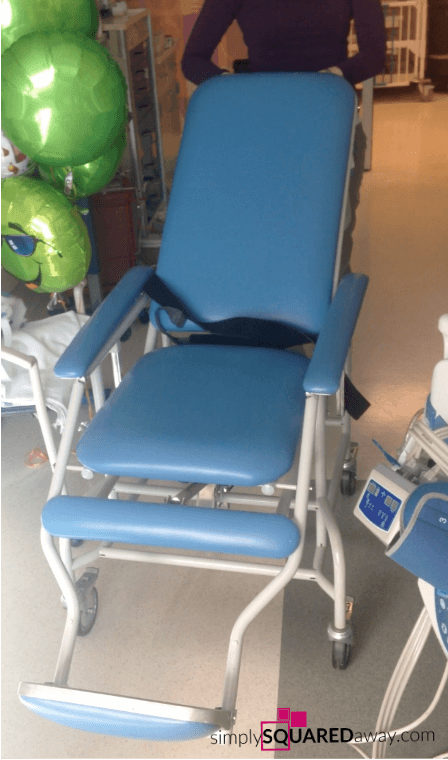 The first goal of his therapists was to get him to move towards vertical, in a wheelchair (his first wheelchair pictured below) and on a standing table. This took time because his blood pressure would drop and he would get really dizzy. Today was the lowest point with news we didn’t want to hear. 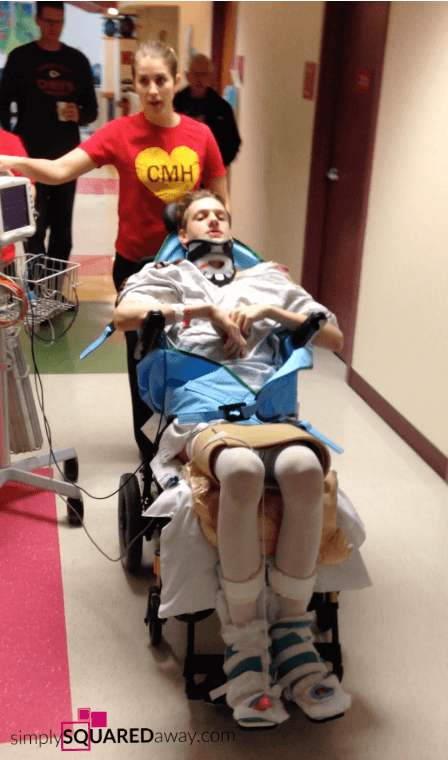 Cayden (and all of us) absorbed the fact he could be in a wheelchair the rest of his life. Nothing is certain and no one knows how much movement he will regain but it wasn’t the news we wanted to hear. He slept and we prayed and within two hours we experienced God’s care as he showed us clear answers to decisions we have to make. He blessed Cayden through loving, generous friends who chipped in and bought him an iPad, case, pen and more. We are humbled by the loving people in our lives and even people we’ve never met. (1.) We moved out of ICU and he has nothing attached to his body now. (2.) His grandparents arrived and a friend brought dinner (amazing!). We gathered around Cayden praying and then eating together as a family. (3.) We had clear answers spoken to us about hard decisions we need to make. (1.) We have two meetings tomorrow. Pray for continued clarity and answers to come together quickly. (2.) Prayer for the whole family as each of us work through this. (3.) Pray that Cayden gets more arm movement and his hands back…then, at least he can play basketball. He told me one good thing if he played wheelchair basketball was that I wouldn’t have to buy him basketball shoes. ? Right before bed Cayden said that “he’s learning to be content with whatever happens.” He amazes us! Before we left ICU we learned that rehabilitation is the next step. We had to make a decision this week what to do. Would we stay in the Children’s hospital that had a rehab department or would we find another rehab hospital to go to? Cayden’s first time outside of his room in a wheelchair. Wow, friend. 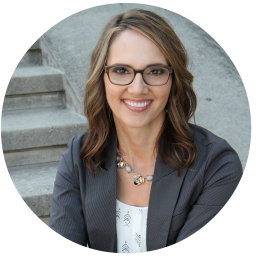 I’m deeply moved by your story of preparation and giving the year 2016 to the Lord. Thank you for sharing this experience with us. You are welcome. God is so good. I love looking back and seeing how He works in each of our lives. I also was in a carb accident and had to be cut out with jaws of life. I was 90 and was unconscious for a number of hours Along with other broken bones I had a concussion with bleeding so my family were called. When I came to I turned healing over to the Lord. I will just say that today I am doing well and feeling well and do use a cane when I go out. So glad you are doing well. Yes, God is a powerful healer! My son has faced an operation to remove a tumor in the left temporal lobe at age 10. He is 24 now and still recovering. 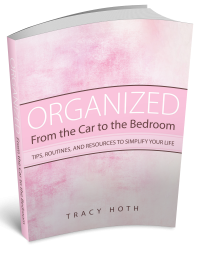 I would love to read how your son is now and how you and your family are doing. I hope u can direct me to an additional part of your family’s story. Our family sends our prayers.